Yup, that is where we are right now. She chose a Hebrew word to describe her level of Hebrew. People have told us by Chanuka our children will be fluent. We were skeptical of that prediction. I guess we were right, they are not fluent, but they are getting there. As I watch the girls pick up more words and practice their newfound vocabulary at home, I can see that they will be fluent eventually. The cake party is only 188 days away, and I can really see that by then things will be closer to a piece of cake. This week, I accomplished another one of my new olah milestones. We celebrated my daughter’s birthday in school. I really did not know what to expect. I have done the school birthday thing in America many times, but I was not sure how it would compare to the one I was supposed to attend this week. My daughter explained that we need to bring a cake and a game. We wanted the game to be simple, with minimal language requirements and as few props as possible, as I was already planning to bring 36 cupcakes on a bus with my stroller and baby. We settled on musical chairs. I confirmed with a few Israelis that it was something Israeli kids would know how to play. On Monday morning, I went to school with cupcakes in hand. Although we scheduled the party for 12 o’clock, the girls were having recess. I got to be a fly on the wall and watch the girls run around, chat and eat snacks for about fifteen minutes. Recess looked pretty similar to the ones I remember in America. At 12:15, the teacher entered the room and the girls followed suit The teacher announced that they would be having a birthday party. The girls were instructed to move their desks to the sides of the room and make a large circle with their chairs. Once in a circle, they sang yom huledet, a second song that I did not know, and happy birthday in English in honor of the English speaking birthday girl. After the songs, the teacher asked my daughter to explain the game in English and the girls would try to understand her. She did, and to my surprise the girls were respectful and appeared to be listening. One girl translated for the kids that were still unclear of what game was being played. The game was a bit of a disaster as our music was too quiet and the girls did not know when to stop dancing and start finding seats. Instead, one girl would start screaming and head toward a chair which would cause the whole class to do the same. Although the game was not played as expected, the girls had fun. It was time for the cupcakes. The girls rearranged the desks and sat down while my daughter passed out napkins and cupcakes. I held my breath. Would they like it? I had no idea what type of birthday cakes the other mothers brought in. 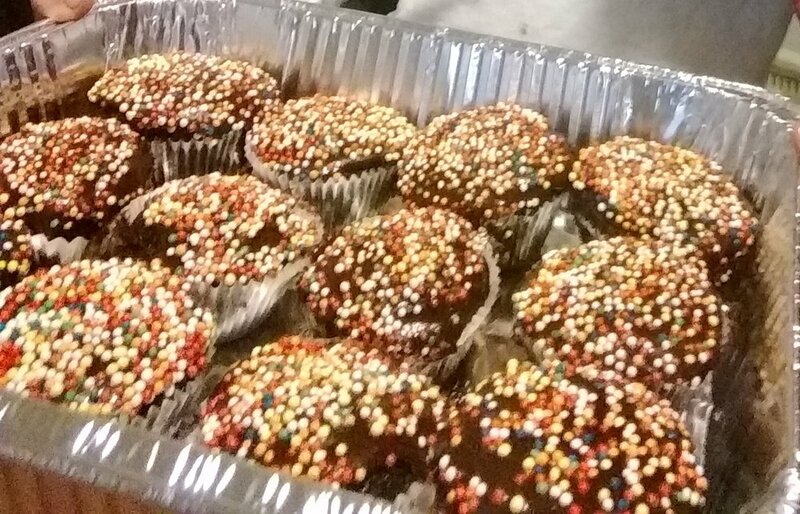 We made chocolate cupcakes with chocolate icing and rainbow sprinkles. As soon as the girls tasted them I heard words of approval. I sighed a sigh of relief. We did it. We pulled off an Israeli birthday. I left the classroom feeling proud. Another first checked off our list.